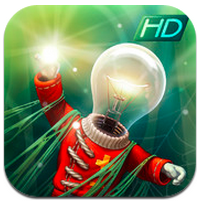 App of the Week: Stay Alight! 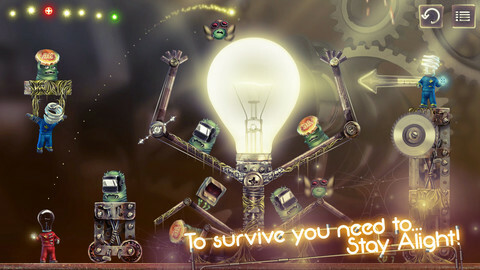 Created by Russia-based Wyse Games, Stay Alight! is a stunning new physics-based game for iPad/iPhone. Within a week of launch, Stay Alight! rose to the App Store’s Top 10 of puzzle and arcade game in five countries. The game’s allure lies in the captivating gameplay and the gorgeous, highly detailed graphics. Each level also provide a host of unique features, from the beautiful music, to the unique movements and sounds of the characters. In the opening scene of the game, players are shown a world filled with garbage, pollution and destruction. In short, microbes have captured the planet and it’s your job destroy them. Making use of physics-based game mechanics, you’re given power balls to complete levels by eliminating a slew of microbes. Each level provides a set number of energy balls and the challenge is to use your weapon strategically so you don’t run out or balls. By aiming a light ball at boxes and barrels in a level, you can eliminate multiple microbes at one time. When hit, these objects roll and bounce towards the monsters and instantly destroy them. Whether you’re a fan of graphical games, or if you love puzzles and arcades, Stay Alight! is sure to capture your attention. Check out Stay Alight! on iTunes for just $0.99. Developed by Brigham Young University, a Corona Labs educational partner, Hideout: Early Reading teaches children to read through a series of interactive activities. 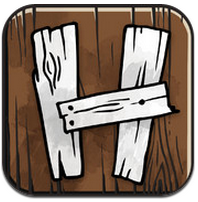 Emphasizing letter-sound association and word repetition to enhance the reading experience, Hideout: Early Reading has already earned a 5-star rating in the App Store. The app’s vibrant illustrations, positive messages, and catchy music are nothing short of impressive. Download Hideout: Early Reading as a free app for your iPhone/iPad. Saw that some days ago. Wou, this game is amazing, great effects and graphics. This is when a game where the gameplay is a plus and the artwork is why i bought it. This is the most (artistically and technically) complete game I’ve ever seen from the early days of Corona. I think the platform is going to gain further respect because of this game! Thanks for the kind responses. We tried to make the game interesting and beautiful, and we’re really glad that you like it! Wonder if they used a level helper / creator app ? No, I dont use level helper. Only corona sdk and TexturePacker. Thanks for reply, that’s good to know as I hate the current level helper programs. What’s your fav text editor for development ? Your game is really well done, would love a intro or set of tips from you, or challenges etc, from making backgrounds scale for 3.5 to 4 inch and relative planning of sprites to essentially make same level on different screens, or combining sprite animations with physics etc … Yes there are tutors on these out there but you can skin a cat many ways – and clearly you have great skills. If really I dont use any special text editor, all game write in Notepad++. Maybe it’s not the most user-friendly editor, but it is well developed ability to write carefully and without error. For menu – each new menu its new scene. For game level – only 1 scene and levels read from *.xml and in this level scene sprites combining with physics. Thanks for info, are there any example you used / learnt from that gave you this idea of game set up? Would e great to see example. So many basic tutorials but haven’t found anything for what you describe and sorta is a big stumbling point.